Are you confused as to why a church would name itself Ekklesia? “Ekklesia” is a Greek word for “Church” that means ‘the assembly of those that are called out’. (For more info, including how to pronounce it, click here.) In today’s society, the term church has come to carry a lot of confusion and hurt, and is often confused as meaning a building or a place where you “go” to worship, rather than something to be — a living, breathing community of Christ-followers. As our leadership team was praying about what to call this new church for which God had given us the vision, we wanted to communicate an uncomplicated idea of simple, authentic Church, but still be fresh so as to capture the attention of the recipient or hearer. That’s why we chose Ekklesia — church, without all the confusion and hurt that has accumulated over the past 2000 years since when Christ established it. When the Old Testament was translated into Greek a few hundred years before Christ, Ekklesia was used to translate the Hebrew word qahal, which means “assembly,” or “congregation.” An Ekklesia was a gathering of people with a shared belief, a common identity. In the New Testament, the early believers used this word for their church gatherings, and it stuck. Later, the Ekklesia would be used to describe all the believers of a particular area … like the Ekklesia of Ephesus. And even still later, Ekklesia was used to describe the global community of Christians — the Ekklesia Universal. However you choose to use Ekklesia, it NEVER describes somewhere that you go, but it ALWAYS describes something that we ARE - together. Acts 2:42-47, is the Heart of Ekklesia. Jesus had just given his final instructions to his followers before He ascended into Heaven. Those instructions were that, empowered by the Holy Spirit, they would be His witnesses in their own city, in their own country, across cultural barriers, and to the ends of the earth (Acts 1:8). Then the promise of heaven happens! The Holy Spirit comes (like Jesus said He would), and filled them, empowered them, and instantly they see 3,000 souls come to know Christ in one day. Praise God, the Ekklesia in Jerusalem was launched … as was Ekklesia Judaea, Ekklesia Samaria, and (by extension) The Ekklesia in Harlan … of course, The Ekklesia Universal. What did the new Ekklesia in Jerusalem look like? Did they build a building? Did they put together a worship team right away? Did they hire a high profile pastor? Did they create a bunch of programs? Did they send their kids to Ekklesia camp? Can it really be that simple? What would happen if you built a church around solid teaching, real fellowship, shared meals, and prayer? Could that actually change the world? That’s what we have been asking at The Ekklesia in Harlan. And we believe the answer is yes. When the real presence and power of God comes on any man, woman, boy, or girl things change and happen! Lives, like the apostle Peter change and become unrecognizable from their previous history. An Ekklesia like that really CAN change the world. “A deep sense of awe came over them all, and the apostles performed many miraculous signs and wonders. And all the believers met together in one place and shared everything they had. They sold their property and possessions and shared the money with those in need.” (Acts 2:43-45, NLT). Their commitment to do those things — to be saturated in Scripture, to live in honest community, to pray — led them to give their lives away. It led them to do uncomfortable things to help those in need. That seems backwards, doesn’t it? It is backwards from our consumer church mindset today that says ‘follow God so you can be more comfortable, happy, and rich’. But the more they committed themselves to the Word, and to community, and to prayer, the more they were prompted to give their lives (and their stuff) away to those in need. We want to be that kind of Ekklesia! We want to commit ourselves to the Lord, to saturate ourselves in His Word to live in honest community to pray and to give our lives away so that others could be added to the Kingdom. 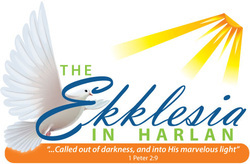 At The Ekklesia in Harlan, Ekklesia means we were never meant to do this alone, as individuals. We are a community — a gathering of people with a common unity. For us, Ekklesia means that we were never intended to be a church in isolation. We are part of a local and global movement. It’s not about our kingdom. It’s about THE KINGDOM. And finally, Ekklesia means that we are to never find our identity in ourselves, our name, our buildings, or our programs. But that our only identity would be found in Christ as witnesses to His life, death, and resurrection and as carriers of the divine message — the message of redemption that can change the world.